Today you get two for the price of one … because I forgot yesterday. Or got distracted. Or something. What’s the one food you feel like you couldn’t live without? What’s the one food you’d rather die than put in your mouth? I cannot live without ice cream. Chocolate ice cream. With nuts. And/or brownies in it. Ice cream is what God eats. But it doesn’t make Him/Her gain any weight. The food I’d rather die than put in my mouth? Canned fish, not tuna, but things like sardines or mussels, or octopi … horrible snotty bits of oily smelly seafood that look like turds in a tin. [shudder] LightHusband and LightBoy love these in a very primal way. It makes my stomach turn just to write these sentences. If you could take a train journey through any part of the world, where would you go? For all of our married life LightHusband has loved to tease me with the idea that he is going to take me to Kenya and we’ll live in a hut there. Now, lest you think I’m a suburban princess who cannot get by in a hut, that is not why I find this forbidding. It’s the heat and humidity. Sub-saharan Africa has always looked like hell to me because I hate heat. Cannot stand it. I’d much rather be cold than hot and I’ve been this way since I was a very small child. So when I daydreamed about this question I was very surprised by the pictures that came to mind. I saw myself in a train, a very old-fashioned steam powered train (by the way), traveling slowly through sub-Saharan Africa!! This train went through lots of small tiny places and I got off everywhere and walked deep into the bush so that I could visit the back of beyond and meet people. It was a fabulous trip. And I loved it. P.S. The train was not air-conditioned. I just wanted all of you to know that. Now “my” sofa is a green micro-fiber suede sofa with a chaise end. I sit on the chaise part. The rest of it is covered in books and papers, with the odd, empty popcorn bowl. Upon one short stack of books, is a pile of unused paper that is a resting place for my coffee. In front of the sofa is an old coffee table. Upon the coffee table are more books and papers, a stack of candle holders, and my laptop case perched precariously on one end. Underneath the coffeetable … more books. And Rosetta Stone Arabic. Because one day soon I really am going to start that. Really. I am. So there it is friends. My destiny, given to me by blood … a recliner surrounded by books. I can only hope that someone will stop by with coffee and water occasionally. Because I needed a good giggle … here’s a look at how I grew up. At least two of my readers will get these, the rest of you will wonder how I’m still sane, or perhaps begin to understand my lack thereof. For the record, I have direct, personal experience with all of the below … yes, all of them. –If your local Dairy Queen is closed from September through May, you live in Vermont. –If someone in a Home Depot store offers you assistance and they don’t work there, you live in Vermont. –If you’ve worn shorts and a parka at the same time, you live in Vermont. –If you’ve had a lengthy telephone conversation with someone who dialed a wrong number, you live in Vermont. –If you measure distance in hours, you live in Vermont. –If you know several people who have hit a deer more than once, you live in Vermont. –If you can drive 75 mph through 2 feet of snow during a raging blizzard without flinching, you live in Vermont. –If you install security lights on your house and garage, but leave both unlocked, you live in Vermont. –If you carry jumpers in your car and your wife knows how to use them, you live in Vermont. –If you design your kid’s Halloween costume to fit over a snowsuit, you live in Vermont. –If the speed limit on the highway is 55 mph — you’re going 80 and everybody is passing you, you live in Vermont . –If you know all 4 seasons: almost winter, winter, mud season and road construction season, you live in Vermont. –If you have more miles on your snow blower than your car, you live in Vermont. –If you find 10 degrees “a little chilly”, you live in Vermont. My parents are here for the holiday. We’re all having a grand time enjoying each other’s company. We all sort of hang out together and laugh and talk. We’ve already enjoyed many memory gaffes. But that’s not my best Christmas gift. We did Christmas morning in our traditional way. Sort of. When I was growing up, the kids got up first. We’d rattle around just enough to wake up my parents. Then we’d get our stockings from the kitchen table. Yes, the table. First of all … we heated with wood and had wood stoves, so Santa would have burned his nether regions if he’d come down our chimneys. So we very thoughtfully left our stockings on the table. I don’t know how he came into our house. As we got older and learned the truth (that Santa is Satan, I mean that Santa isn’t real) we just kept leaving stockings on the table. So, us kids would get our stockings, plus Mom and Dad’s and take them up to my parents’ room. We’d all sit on their bed and open the stockings. When I was growing up stocking gifts were wrapped in newspaper. My parents have a gift with stockings … they do their best work with stocking gifts. They are inventive and silly; thoughtful and whimsical. I think that is my Dad’s contribution to Christmas, but I’m not entirely certain. After stockings, we have breakfast. Then we’d feed and water all the animals … chickens, geese, cows, horses, dogs, cats, sheep. Some of the favored animals would often get a special treat or special ration of grain or something. Load the wood bins for the day. The woodstoves did not get any special wood. Clean up the kitchen and be dressed in decent clothes. After all of that, the unwrapping of the gifts would commence. We went one gift at a time … youngest to oldest. Everyone had to wait turns and watch each person unwrap so we all knew what everyone got. This eternally confounded my maternal grandfather. He managed to call every year when we were about 1/3 of the way finished to talk to us. Every year he was surprised that we weren’t finished. Every year … Surprise! What?? He was of the rip and tear all at once theory. We did not ascribe to that theory. It was funny. And we all always laughed. LightGirl was the next person up at 6:30 so she joined me with some hot chocolate, then LightBoy for some hot chocolate. We had a few minutes together with our drinks looking at the tree. But that wasn’t my best gift. LightMom and LightDad came downstairs and we opened stockings that had been left (as we do) on the kitchen table. But we do this in the family room. It was so much fun to have them participating the stockings again … as I wrote above … it is their gift. But that wasn’t it either. We did breakfast, cleaned up. And began opening. We were most of the way through when I got a gift with a tag that read: “This made Mom cry, but it will make you laugh. To Sonja Love from Mom & Dad” LightHusband jumped to get his camera. LightMom looked funny and I was not certain I wanted to open this package. If it made my mom cry, I was fairly certain I might cry too … and just what was contained herein that made my mom cry on Christmas?? It was all too mysterious … and squishy as well. Then it was revealed and we all dissolved into howls of laughter. The story goes like this: When I was a baby my mom knit me a stocking. It was the stocking I had all through my childhood. Until a small closet fire when I was about 10 years old. The fire was started by my little brother who was playing with matches. My stocking and my other brother’s stocking and other family things burned up. My mother burned her hand pretty badly, too. I think a lot of my dad’s things from his term of service in Alaska were destroyed. So the stockings were gone. Except for the brother’s who had started the fire. There is no justice. Oh wait. My mother was too busy by the time he came along to ever knit him a stocking. So now none of us had stockings. Maybe there was justice. But I mourned my stocking. I held no grudge, I just missed my stocking. When I got married, I discovered that LightHusband had had the same stocking all his childhood that his mother had knit for him as a baby!! What are the chances? So my new mother-in-law knit me a matching stocking. I had a new treasure and I loved it because of it’s ties and significance. When the babies started to come along in all of our siblings families I discovered that my mother had been hiding her light under a bushel all these years. My mother loved to knit! She became a knitting machine churning out tiny sweaters and hats and mittens for the grandchildren. Each one also got a personalized Christmas stocking. I don’t mean name either. She would change and modify the directions to make the stocking for each child personally. They are all beautiful. So are all the sweaters and hats and mittens. We have all treasured them. Sometime less than 4 years ago, my mother surprised me with a replacement stocking for the one in my childhood. We can’t remember the exact year, but we know it was since the youngest of my nieces was born and she turned 5 this past June. But she forgot. We don’t know what happened … she just forgot that she’d done that. I didn’t. But then you never tell the recipient of a gift what you’re thinking. In my family of origin that principle gets carried out perhaps a little too far. You tell no one. We operate like the Dept. of Defense when it comes to Christmas. So my mother did not even mention this to LightHusband, because he would have known and reminded her. So she planned and found the special wool (white angora) to make Santa’s beard. She knit away on their trip to Florida and back to visit my uncle this fall. She grinned happily when she read my philosophy on gifting on my blog. She was thrilled at her choice in gifts this year. She knew she had outdone herself. And … she had. Oh yes … she had. She had outdone herself TWICE!! I am doubly blessed! 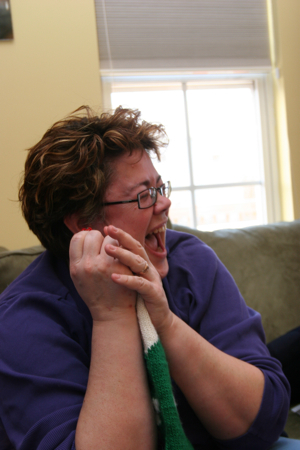 So that is the story of my best Christmas gift … of 2007. Once in a lifetime….I hope! 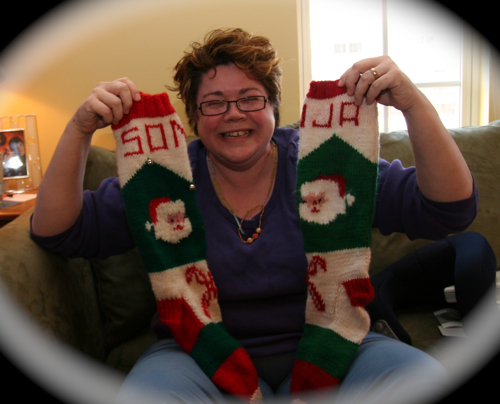 In the 50’s I started knitting Christmas Stockings for my nephews – nieces would arrive much later! As our children were born (1961, 1963, 1nd 1965) I knit them what had become a favorite stocking with name, a Santa with angora beard, and crossed candy canes. In the summer of 1969 with Sonja at camp and LightUncle1 visiting a friend, LightUncle2 (not quite 4) practiced lighting matches in the front closet of our home at Kent’s Corner. And, of course, the result was….fire! Fortunately for us the closet was lined with tongue and groove cedar boards and GrandPea and I were able to squelch the fire and throw much of the burning material out the door onto the lawn. Among the belongings that were too burned to save were Sonja and LightUncle2’s stockings. I suppose in the back of my mind I intended to replace them but ….it must have been w-a-a-y-y back! LightUncle1 continued to use his stocking, and when his daughter was born in 2002 asked if I might knit one for her. I searched the internet and various knitting stores for the pattern, but it was not to be found. So, I did my best using LightUncle1’s as the model. He was satisfied, I was not. Since we are trying to get rid of the flotsam and jetsam that has accumulated over 45+ years, we are continually sorting through it all. And wa-la I found the original – now 50 year old – pattern. So, I set about re-knitting LightNiece3’s stocking (I hadn’t liked the non-wool yarn I had used, either) and now (2004) one for her brother, LightNephew. So, this Christmas I decided to start replacing the burned stockings and since we were due to spend Christmas with Sonja and family, hers would be for this year! So I set about the task, and a friend found me some faux angora. And it was actually completed before we boarded the train to D.C.
Sonja had written that she and her family were trying to move toward a less commercialized Christmas and she most wanted to give gifts that she made or were really relevent to the giver/givee. Ahh… I had the perfect gift! So now…imagine my dismay when I walked in their home to find……………..all their stockings ‘hung with care..’ and one of them being a replacement stocking I had apparently knit around 2004 or 2005! I was crushed. This was to be my major gift to my daughter and it was now a mere ditto! I decided I needed to ‘punt’. Instead of hanging the stocking after she went to bed Christmas Eve – my original plan – I wrapped it as a gift under the tree. The tag read, “love to Sonja from Mom and Dad. This will make your mother cry and you laugh.” I forewarned photographer son-in-law, LightHusband, to be ready with his camera. And boy, did we laugh – the laughter went on for some time – we held our sides and wiped the tears and just let it roll. Even a ditto can be the best Christmas present ever! I haven’t posted in a while. I think it might be the longest while ever. This is not a good record to break. But I suspect that all will live and probably thrive. I finally gave up and just marked “all as read,” in my Googlereader. Some of you will go unread into the dustbin of history. I feel really badly about that … I really do. But I was overwhelmed. Completely. Still … all will live and probably thrive. Such is the stuff of life. Some really good things have happened lately. My blog, that would be this very blog that you have cast your eyes up now, was accepted into The Daily Scribe. It happened several weeks ago and you may have noticed the shiny new logo in my sidebar. I try to keep it gleaming and crisp because I’ve still got a shine on too about the whole thing. Wander on over to the village square and check them out … what a bunch of fabulous writers and thinkers are gathered there. We’ve managed to have a few gatherings in our home to celebrate Advent. This has been wonderful and gentle and most of all expectant. The most amazing thing was being able to pray through Isaiah 35:1-10 using lectio divina with 7 children ranging in age from 8 to 14 last evening … and only 5 adults. And, both children and adults got something out of it. I’m still amazed. The kids are loving it too. This is even more amazing. I love watching God at play among the people. This weekend was so hectic. Four hockey games, a hockey party (for LightGirl’s team), Advent gathering and yes, we squoze in time to breath and eat. The party for LightGirl’s team was so much fun. We had it here at the house. 11 girls, 2 boys and assorted parents. I planned lunch, a couple of activities and lots of time for talking and giggling. 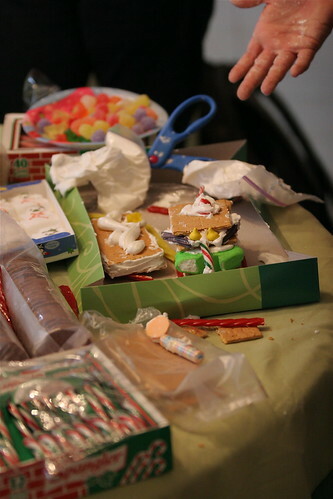 One of the activities was building gingerbread houses with ye olde standby … the trusty graham cracker. I didn’t think the girls would buy into it. But it was their favorite thing. They begged to get started and were completely into it. Much more than I anticipated 12, 13 and 14 yo girls would be. I still have their creations proudly displayed on the breakfast bar. I don’t have the heart to properly dispose of them. They are beautiful. LightBoy and his friend made gingerbread tanks (of course!) … after doing the appropriate research! Hilarious. My poor, deprived children. They get great, creative ideas and their deranged socially alert mother shoots ’em down and makes them create out of recycled soda bottles and tissue paper … it was the saddest angel ornament you ever saw. I think Sam the dog might “accidently” eat it. That would be a shame. Maybe I will give him a little bit of guidance tomorrow. I spent today fighting with my blog to upgrade it. Tomorrow I can do fun things like make cookies and angel ornaments with my children. Today I had to fight with technology. Maybe tomorrow I will be in a better mood. Tomorrah is a bettah day, after all. John Smulo is starting another meme (isn’t there a limit on these?). But this one is fun and is sort of like a (non)commercial break in the action. And you self-select your participation. Here are the rules, but in grand pirate tradition … they’re more like guidelines. Write down your four favorite Christmas movies in descending order. Tag the first ten people who respond in your comment section saying they want to particpate. Okay … so … rules (but they’re more like guidelines) established and all that. Here are my four or so favorite Christmas movies in (no particular) order. 1. 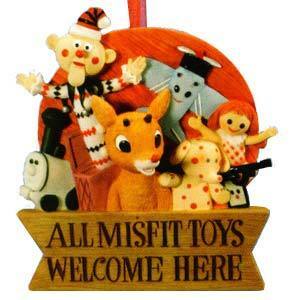 Rudolph The Red-Nosed Reindeer … the 1964 edition and I’m partial to this for the Island of Mis-fit Toys. 2. How the Grinch Stole Christmas … the 1966 edition – I love Cindy Lu Who and her great big heart. 3. Home Alone (the first one) … in the midst of the slap-stick hilarity there is a lot of really spiritual stuff going on that’s worth watching and thinking about, plus I really love Joe Pesci in this. 4. Chevy Chase’s Christmas Vacation … just fun and the scenes at dinner knock me over.